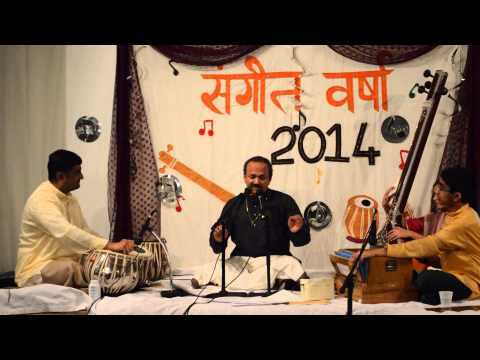 Welcome to Svara Sangam, a school of North Indian classical music, a.k.a. Hindustani classical music, founded by Shri. Hemant Kulkarni. The school has been involved in promoting this music in the U.S. by providing instructions in vocal music and harmonium to a variety of age groups in the New Jersey / New York area. It is very gratifying to see excellent progress shown by the students most of whom were born and raised in the U.S. Some of them have performed at public events and on Community TV and Radio channels. We offer group lessons in vocal and instrumental music. Online Classes may be available for remote locations. We also offer public concerts for interested audiences. Svara Sangam School has received the affiliation and Examination Center status from the well-known Indian Music Institution, Akhil Bharatiya Gandharva Mahavidyalay (ABGMV) Mandal. Qualified candidates can take Certificate exams up to Madhyama II at the school facility. Several students have passed these Exams with distinction so far. Shri. 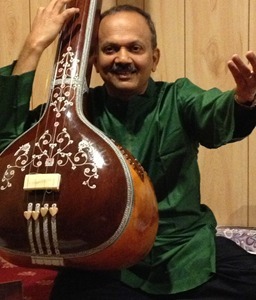 Hemant Kulkarni is trained in the Gwalior and Agra Gharana gayaki. He has been teaching vocal music and harmonium in the NJ area. He has been frequently invited to sing at the Marathi Vishwa Soor Bahar event in NJ. He and his students have a variety of classical and semi-classical music programs in the U.S. His students have won several awards at contests featuring Hindustani Classical and Semi-classical vocal & instrumental music in NJ, Baltimore, Atlanta etc. I have had the pleasure of frequently providing Tabla saath to Hemant and his students for over a decade. Accompanying them is particularly joyful for me because of their extraordinary technical & artistic abilities, the diversity of taals they perform in, and the meticulous attention they pay to Laya and Taal. I wish him great luck. It was my pleasure listening to all your students. They all were thoroughly prepared. This is the first time in last so many years in North America that I could ask all the questions. Otherwise there are always so many reasons by the teachers supporting their student's unprepared presentations. I enjoyed the exams. I would definitely like to come again in future. This is to express my sincere appreciation of your efforts to train youngsters in the art of Hindustani Classical Music and thereby promote it in U.S.A. As far as my knowledge goes, none other in New Jersey has been able to achieve this to the extend you have done it. Kudos to you indeed. Though I have dedicated myself to this art right from the age of 15. I want to provide a testimonial! Big Svara Sangam Win at Marathi Vishwa’s Swaradhara 2019 Competition. Winners List and videos are on the Events Page. Big Svara Sangam win at AIMFA’s 35th Indian Music Competition 2018 in Columbia, MD! Winners List and Videos are in the Events Page. Svara Sangam students win at Pt. 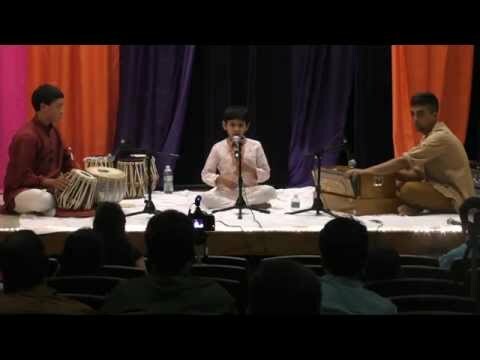 Jasraj Institute of Music Contest AKA PJIM Contest in NJ. Big Svara Sangam win at AIMFA’s Indian Music Competition 2016 in Columbia, MD! Winners List and Videos are in the Events Page. Basant Bahar 2016 was a huge success! Srikar Ayyalasomayajula played harmonium and Nandan Shastry sang at the Madhyam Nava-gandharva festival ! Srikar Ayyalasomayajula and Ajita Nair played a harmonium solo and sang respectively at Raag-Rang’s Kal Ke Kalakaar program!